Write your NetIQ Knowledge Scripts® using reliable PowerShell and .NET languages like C#, VB.NET or J#. 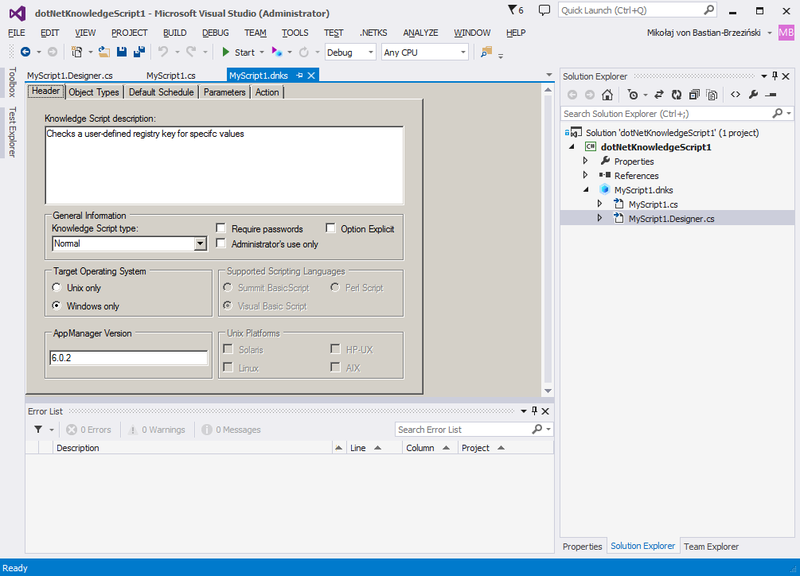 Utilize Visual Studio integration with easy project templates. Embrace .NET frameworks in your scripts and keep safe with compilation. Use PowerShell modules and existing admin scripts. Track your code in VSTS or JIRA with all other .NET projects. 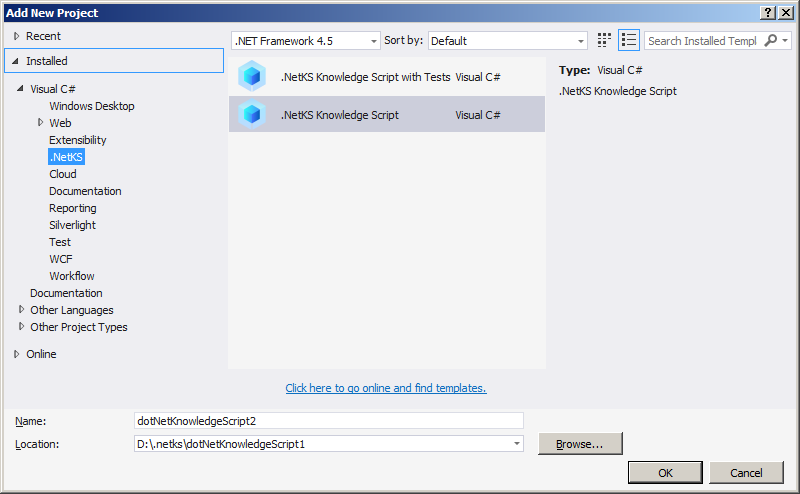 Test your Knowledge Scripts® with well known frameworks and tools. Use NUnit, Microsoft Tests for local testing and build servers to integrate your changes. Verify your code with Visual Studio code analyses and easily spot you logic with .NET development tools. Build your code with single-click and get NetIQ ready QMLs in output. Deploy your projects with continues delivery and check-in to NetIQ as regular QML files. Get your code running in .NET on Windows and Unix platforms without any changes in NetIQ just using old drag & drop to target machine. in the creation of more powerful AppManager Knowledge Scripts® in less time and at lower costs. .NetKS Knowledge Scripts® share code across platforms. Target Windows and Unix systems with single shared C#/J# or VB.NET codebase. Use single language to build your logic and compile two QMLs. Building your KS in .NET you can leverage huge base of .NET frameworks for analyzing web requests, system performance, making WMI calls, checking registries or analyze logs using out-of-the-box tools to quickly get your work done. Handover the operations monitoring scripts implementation to your existing .NET development teams. Embrace their experience and possibilities of advanced programming language. Get your more reliable scripts faster, well tested, easier to debug and at lower costs. Scripts can be implement in well known Visual Studio development environment using .NetKS projects templates. As output you will get compiled QMLs fully compatible with AppManager – ready to check-in and deploy. As an system administrator I am really enjoying that we can handover the development to developers and they are happy to get it done. We just provide the requirements and get the scripts done faster then ever. With this approach we can fully focus on designing our monitoring architectures and keep the operations up and running. .NetKS offers the best and unique solution for NetIQ AppManager. Writing standard custom scripts in VB or Perl can be extremely painful and time consuming even for the simplest tasks. Seeing that we can do it in .NET using our favorite IDE with test-driven development and get it deployed both on Windows and Unix makes this work a dream. With .NetKS you can deliver more scripts in the same time and re-use the logic between the scripts very easily by implementing shared DLLs. It let us take advantage of the whole development potential. Join our free webinar events and see .NetKS in action and learn how it can improve your business. Read more about our amazing possibilities that we can offer in the feature sections. Any questions or special requirements? Contact us and we will do our best to deliver what you need. Want to learn more? Check our professional online and on-site trainings offer. Let us explain how your IT Operations Management could profit from writing NetIQ AppManager KnowledgeScripts using .NET! Cut the costs and increase your performance! .NetKS the best and unique solutions that allows you create NetIQ AppManager Knowledge Scripts in .NET technology. Use the same code on Windows and Linux, utilize your .NET resource and get more power and possibilities with less time.